FDMC Digital Media in conjunction with Biz Foundry of Cookeville will be holding a video production class for small business and entrepreneurship. The class will focus on Social Media platforms and how to use digital media for marketing. The class will held March 18th from 5:30 to 8:30 with very extensive production techniques and applications. The Biz Foundry is a non-profit organization founded to help the Upper Cumberland business start-ups. It functions in cooperation with the State of Tennessee. FDMC, with it's relocation to the state of Tennessee has begun a re branding of its name. Mr. Garton, owner of FDMC stated that while current logos will not change that much. "However, since we begun to use FDMC Digital Media as the name of the company and registering as such, the web address for years has had the name "Floridadude" in it." "I pretty much started this business as a small part-time hobby and my friends always called me dude." I thought at the time that would be a catchy Florida name. I was still learning. " The old domain will work until it expires but the company domain will soon become First Digital Media Concepts as will all company email." "FDMC Digital Media as the name of the business will remain. Both domains will be up and operational in a month" Garton stated. Roy Garton, CEO of FDMC Digital Media announced today that FDMC Digital Media was selected to partner with the City of Cookevile's Leisure Services Division to produce a series of videos about that department's services. Mr. Garton stated "We are delighted to work with the great folks in this city." "As newcomers we understand developing trust and partnerships is tough" but we were able to demonstrate our work from previous jobs and they loved it." Mr. Garton said. FDMC provides digital media consulting in the fields of social media, web, and video production. They are located in Cookeville, Tennessee. FDMC Digital Media announced today that they were selected as the Social Media Consultants for the Center OF The Visually Imparied's 2018 "Dining In The Dark" event. As one of their major fund raising events for Brevard County, "Dining In The Dark" is considered now a major signature event that everyone embraces. "We are just thrilled to be handling this wonderful organization's social media." CEO and President Roy Garton stated. Dining In the Dark will be held April 21st. FDMC' CEO, Roy Garton announced today that their video division recently completed two large musical band projects. One was for the band "Nightfly" for their marketing and the other was for Jack Starr's "Burning Starr" band. "Both projects were very intense in nature and took several months to complete." stated Garton. Garton went on to say that "Our clients wree very happy with their projects!" Nightfly is a very popular up and coming funk and rock band out of Sebastian, FL. Burning Starr has been around since the 80's with a very strong following in England and is in the process of working on a new album. The video just completed is a promotional cut that will be used to market that new album and their single. FDMC media recently worked with NBC News during the devasting hurricane that hit Brevard County and because of our dedicated work, became a 2 year contractor for NBC news within Brevard -Indian RiverCounties for any future news breaking events. We recently covered President elect Donald Trump's visit to the Melbourne, FL area for two clients as well. Mr. Garton is a seasoned news journalist having covered 3 previous Presidential visits and carries a dgree in journalism. He has worked as a news reporter and video journalist for various stations and as a free-lancer. His news packages have been on CBS, NBC, ABC, CNN, and The Weather Channel. FDMC Media recently completed a fun dance video showing the staff and residents of Buena Vida Estates getting their goove on to the Uptown Funk song by Bruno Mars. The video was a chance to showcase the Estate's senior residents as well as the staff enjoying interacting with each other. It also demonstrates that no matter what your age, you can be young at heart and enjoy life. Doreen Brodeau, the marketing director for the property coordinated the shoot with selected residents. "We were very happy to be a part of this fun project!" stated Mr. Garton, ownere of FDMC Social and Digital Media. Working with the residents and statff was a joy. Roy added. FDMC Social and Digital Media recently completed a marketing project for new chamber members D&H Magic Air. Web site enhancements and a promotional video were recently introduced into their branding mix. D&H Magic Air has served the Space Coast and Central Florida for many years and FDMC was glad to be a part of their marketing strategy upgrades. Roy Garton, owner of FDMC Social and Digital Media recently went through YouTube's Creator Acadamy which allows him to professionally consult with customers and clients as a certified YouTube Partner. "I'm excited to be able to recommend YouTube as a paltform for our customers in engaging video." stated Garton. YouTube is the top platform for both consumer and businesses alike in presenting videos. Roy's expanded training and expertise with YouTube will now allow a solid partnership of audience growth for their customer base. 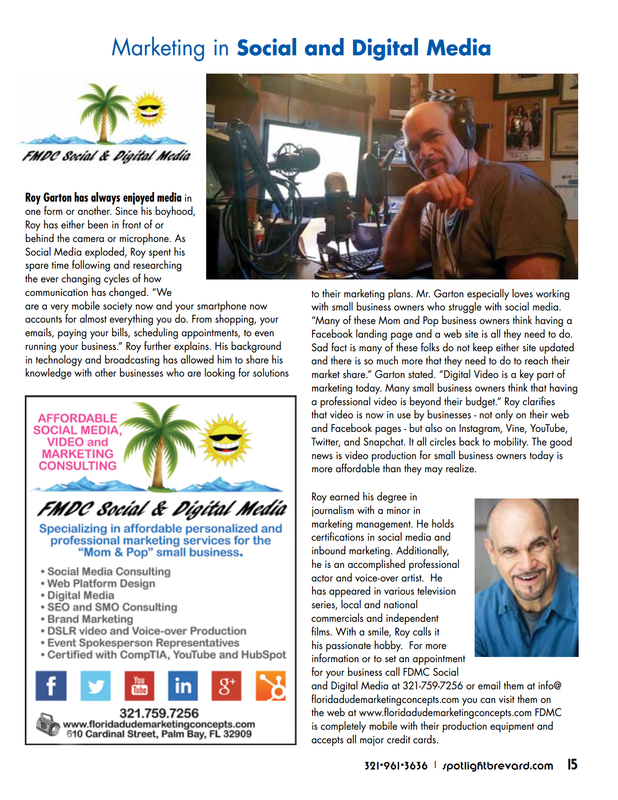 FDMC Social and Digital Media was featured in the May edition of Spotlight Magazine as Mr. Garton talked about his business and how they champion for the small business owner, assisting with their social and digital media needs. Click on the picture to go to the on line version of the magazine article and a special thank you to Brian and the staff of Spotlight Magazine for doing the story!